John Rabolt, the Karl. W. and Renate Böer Professor of Materials Science and Engineering, and D. Bruce Chase, a research professor in the Department of Materials Science and Engineering, both at the University of Delaware, have received the 2018 Award for Cooperative Research in Polymer Science and Engineering from the American Chemical Society Division of Polymeric Materials Science and Engineering. They were honored at a symposium on Tuesday, March 20, 2018 at the national American Chemical Society annual meeting in New Orleans. They received the award at the Division of Polymeric Materials: Science and Engineering and Division of Polymer Chemistry joint awards reception on Wednesday, March 21, 2018. Rabolt and Chase, known for bridging the gap between academia and industry, have invented technologies and methods that have been widely adopted by scientists and engineers worldwide. For example, in the 1980s, they co-developed Fourier Transform Raman (FT-Raman) spectroscopy, which uses lasers to probe the structure and properties of polymers. FT-Raman spectroscopy is currently used in thousands of laboratories worldwide. Rabolt and Chase have produced more than 69 joint publications, filed several patents, co-founded two startup companies and co-mentored 15 doctoral and six Master’s degree students. Their startup company, PAIR Technologies LLC (2005 to 2016) involved the design and construction of the next generation of infrared spectrographic instrumentation. Their planar array IR (PA-IR) recorded an infrared spectrum in less than 10 milliseconds. Their newest startup, Resonate Forward LLC, designs and builds vibratory devices that mitigate the symptoms of Parkinson’s Disease patients. The two met in the early 1980s at a conference in Durham, England. Rabolt was a polymer scientist at the IBM Almaden Research Center in San Jose, CA, and Chase was a fellow in DuPont’s Central Research Department at the Experimental Station in Wilmington, DE. During a conversation over beer, they realized that they had similar interests. They started working together on research projects over the next few years. “This industry-industry collaboration was unusual at the time,” said Chase. 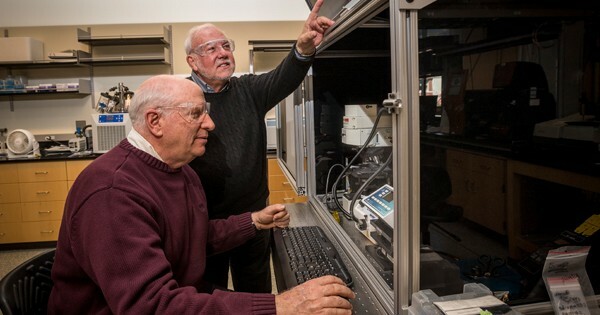 Their collaboration grew stronger in 1996, when Rabolt moved east to become the founding Chair of Materials Science and Engineering at the University of Delaware. He has continued a highly active research program in polymer deformation and orientation, electrospinning polymer nanofibers, organic thin films, IR/Raman spectroscopy, instrumental development and biomolecular materials for tissue engineering. In 2009, Chase retired from DuPont and came to UD to continue his research in vibrational spectroscopy, FT-infrared and Raman techniques, and applications to industrial analytical problems. Now, the scientists who used to collaborate from two different coasts have offices side by side in UD’s DuPont Hall. Their expertise is complementary. Chase is an analytical chemist, Rabolt a polymer physicist. Their personalities balance as well, as Chase is a self-proclaimed pessimist, Rabolt an optimist. Together they have pushed the frontiers of polymer science and show no signs of slowing down. In their most recent paper, published in ACS Applied Nanomaterials on February 8, 2018, they described how the use of silver-coated gold nanorods as environmental sensors to detect contaminants such as arsenic in groundwater. On March 12, 2018, they received a patent for their invention of gold nanorod/polymer nanocomposites and sensors based on them. Rabolt and Chase are not just prolific polymer scientists—they have also become friends over the years. They go out for beers and celebrate their birthdays, as they happen to be about the same age—born just four weeks apart. Rabolt received a bachelor’s degree in physics from the State University of New York in Oneonta in 1970 and a doctoral degree in physics from Southern Illinois University in Carbondale in 1974. D. Bruce Chase received a bachelor’s degree in mathematics and chemistry from Williams College in 1970 and a doctoral degree in physical chemistry from Princeton University in 1975. In 2013, they shared the Innovation in Materials Characterization Award from the Materials Research Society.